New MX1000 system is engineered for security installations prone to dust, debris, shock, vibration, extreme temperatures and the rigors of transportation applications. July 14, 2015 (SOUTH BURLINGTON, VT) - Leading manufacturer of industrial and embedded computers, Logic Supply (www.logicsupply.com) has released the first ever rugged mobile NVR certified by Milestone Systems, the global leader in open platform IP video management software, for use with their XProtect® VMS platform. 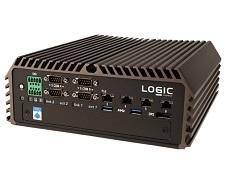 The Logic Supply MX1000 is available now by visiting www.logicsupply.com/milestone, by calling 02037 697 073, or via the Milestone Solution Finder. The MX1000 will also be offered via select Milestone resellers. The MX1000 is powered by an Intel Quad-Core i7 processor, enabling the system to collect and process video from up to 25 HD cameras simultaneously. The hardened, fully fanless and ventless enclosure protects the system from dust and dirt and helps prevent tampering. Onboard storage is provided by a 2.5” HDD/SSD for up to 2 TB of total capacity with a 1TB SSD standard. The system also comes standard with 8GB of memory with optional wide temperature components allowing for 0°C~60°C operation. Expandability is available via one full height and one half height PCIe Mini Card slot. The Milestone Solution Certification provides verification that the MX1000 is optimized for performance with XProtect® VMS software. The certification documentation (view here) presents a summary of the results of the testing process. About Milestone Systems: Milestone Systems is a global industry leader in open platform IP video management software, founded in 1998 and now operating as a stand-alone company in the Canon Group. Milestone technology is easy to manage, reliable and proven in thousands of customer installations, providing flexible choices in network hardware and integrations with other systems. Sold through partners in more than 100 countries, Milestone solutions help organizations to manage risks, protect people and assets, optimize processes and reduce costs. For more information, visit: www.milestonesys.com. About Logic Supply: Logic Supply specializes in highly-reliable NVRs for challenging surveillance environments. Customers, including those in transportation, construction, energy, oil & gas, and law enforcement, rely on Logic Supply’s rugged hardware to help monitor and secure their infrastructure. In addition to their surveillance and security products, Logic Supply offers branding and customization services for integrators who desire a one-stop approach. More than just a hardware company, Logic Supply is committed to offering ongoing fulfillment and support services for partners to help ensure project success every step of the way. Visit the Logic Supply website at //www.logicsupply.com/.